The Miniature Schnauzer, much like its larger counterparts, is known for distinctive facial hair. Lincoln, Clooney, and Santa are a few names coming from people known for their beards. The breed is a smaller version of the Schnauzer much like dwarves and hobbits are smaller version of people. 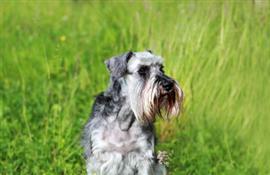 In Germany, the breed is referred to as Zwergschnauzer which means ‘Dwarf Schnauzer’. Finding some dwarf inspired names requires a person to look no further than ‘Snow White and the Seven Dwarves’. Doc, Happy, and Grumpy are three excellent choices. The ‘Lord of the Rings’ series provides more than enough hobbit names. Frodo, Bilbo, Daisy, and Pearl are just a small sampling of those available. If you want a name that is out of this world, consider a well-known astronaut. Buzz, Armstrong, and Scott are all big names from NASA that would make a perfect fit for your puppy. With the Miniature Schnauzer’s German roots, a few names closer to home include Gretel, Heidi, and Hans. Some of our pages will contain a subcategory. A subcategory is a slightly more specific grouping than the main topic of the page. For a subcategory, we will include a separated table of names and corresponding descriptions. An example of a subcategory of Red Dog Names would be 'Dog Names Inspired by Red Wines'. If you have any subcategory ideas for the Miniature Schnauzer Names page, we would love to hear them. Use the form below to submit your ideas.